The IMRAD, hourglass, inverted pyramid, and hamburger structures are all options you can use - it is up to you to find which works best for your article. I’ll offer a two-part response to this question, as I see two different possibilities at work here: organization and concision. Let’s start with organization. There is no recommended structure for journal articles in the humanities. As such, these articles differ from those in education, the social sciences, and the sciences, which tend to follow the IMRAD (“Introduction, Methods, Results, and Discussion”) structure. Researchers in these disciplines may believe that they don’t need to be concerned about the organization that governs their articles. Having learned the IMRAD convention from their mentors and seen it in the work of their peers, these researchers may perceive IMRAD to be a kind of evolutionary pinnacle — an organization scheme that has adapted to its environs, the peer-reviewed journal, through mutation and development over generations. Dr. Sword advises academics to draw on Woolf’s formal innovation in the novel as inspiration and try integrating unexpected structures within a hybridized IMRAD, because “unique and experimental structures can open up new ways of approaching familiar issues.” Dr. Sword’s excellent chapter on “Structural Designs” in Stylish Academic Writing offers suggestions on how to integrate hybridity and innovative structures within IMRAD; for writers of IMRAD-format papers, what follows will also offer some options that bridge innovation and convention. Dear letter-writer, this is a long way of saying: the quandary you face is, in some ways, a boon. Working in the humanities, your arguments and thinking are not governed by a strict organizational structure that risks binding the limits of your work. Yes, the journal article itself has conventions — it is a genre of writing distinct from the novel, the email, the grant application — but these conventions, in the humanities, don’t include an organizational scheme as strict as IRMAD. So what should you do when you’re struggling to organize your thoughts in a coherent, unified argument? 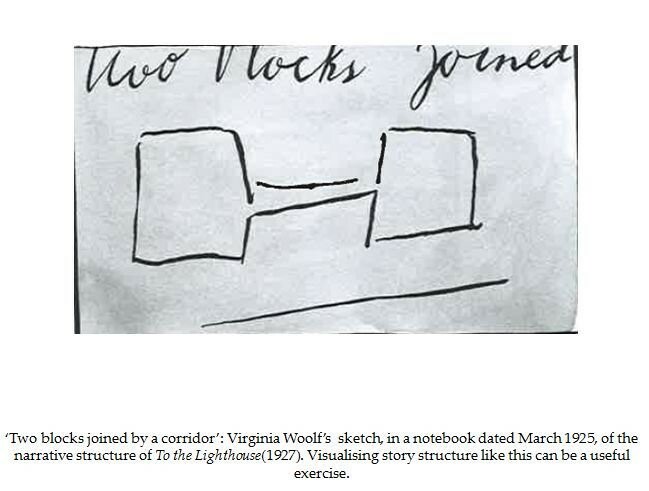 Summon Virginia Woolf: draw your structure. I was working with a researcher whose argument, I felt, kept taking an odd left turn. She felt the turn was integral; I didn’t see how it fit. It was only when we together drew the structure of her article that we were able to see how what I perceived as a left turn was, in fact, meant to be an extension of her central argument. 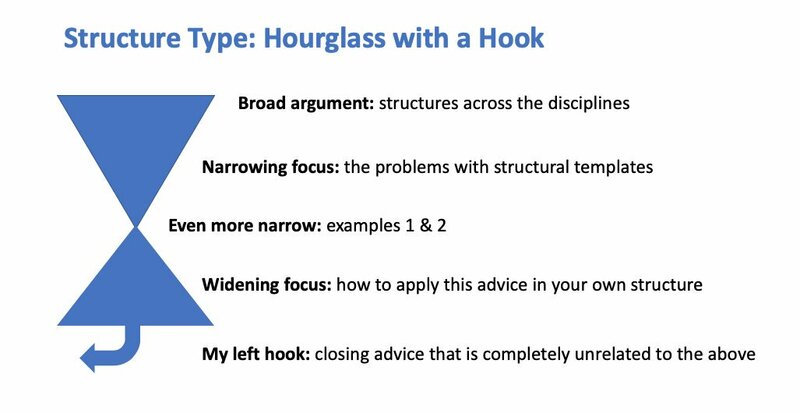 Once we together determined the shape of her argument, we were able to implement strategies to improve paragraph structure and flow, which helped bring this ideal shape into being for her article. Listening to Tanya Talaga’s excellent 2018 CBC Massey Lecture in Vancouver, “The Third Space,” I was struck by the repeated shifts in focus in her structure, from breadth to nuanced depth. When I got home from the lecture, I drew a series of networked nodes that I thought encompassed the form of her argument. 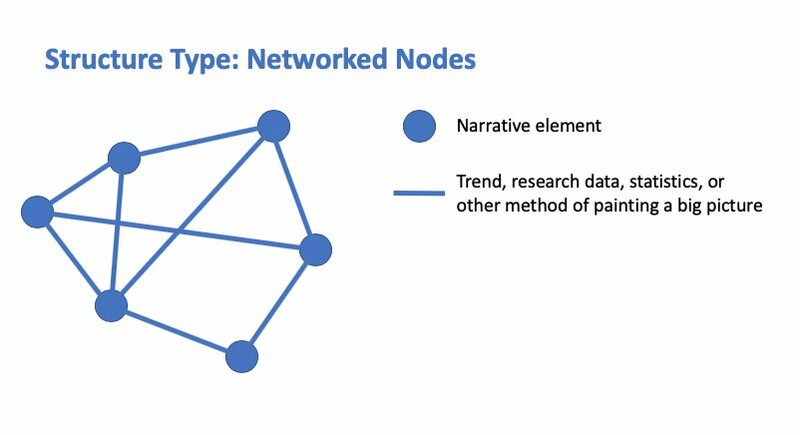 I knew from Elements of Indigenous Style (2018) that Greg Younging sees Indigenous writers as structuring their work along “a wheel of understanding” that doesn’t fit on to the “line-by-line linear map” of “Eurostructure.” As I recover from a minor medical procedure in early 2019, I look forward to listening to the recordings of all of Ms. Talaga’s five lectures, to see if Mr. Younging’s circle theory holds for Ms. Talaga’s five-part lecture series. Dear letter-writer, your question evoked a temporal metaphor, the “pacing” of the journal article. I encourage you to shift your metaphor and think of your writing as occupying space rather than time. Draw out the shape of your argument, using a wide box to suggest the breadth of your claims — the moments when you are writing about the significance of your argument, and its relationship to other scholars — and a narrow one to indicate where you’ve narrowed your focus to analyze something detailed and specific, such as a line of a poem or quotation from a primary source. If you’ve drawn a top-heavy structure — something like the Qube building — ask yourself if there are moments where you can disperse the detailed analysis throughout your broader sections by, for example, front-loading a detail as a hook, or weaving in vignettes or case studies. As you draw the shape of your article, you may find that — as Dr. Rowlinson argues — in the field of literary studies, a review of the literature that is separate from one’s own detailed analysis is not conventional. 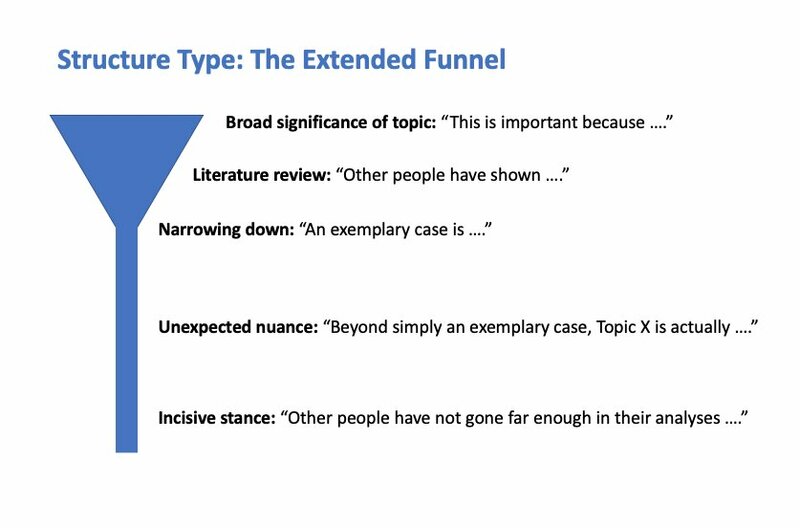 If your argument depends on the inclusion of a literature review, then ensure that the structure you’re drawing with your words has a logical space to include this section. And, in closing — I promised a second part to this piece that’d be focused on concision, and I’ll keep it brief. Write short. Keep your sentences under 25 words. Cut “is”. Favour the active voice. Reduce the word count in the structurally ‘wide’ sections of your article, and your edits will help you to shift the balance of your paper from breadth to depth.